Welcome to the ODBD August New Release post and Blog Hop showcasing projects from Our Daily Bread Designs August Release! You can see all of the fun August Releases here. Continue reading below to find out how you can win one of three $25 Gift Codes to the ODBD Website. The August release is full of fabulous Sports related Stamp/Die Duo sets and can be used with many of Our Daily Bread Designs other Custom Dies and paper collections. If you love Tri-Shutter cards, but don't like the amount of time to it takes to create them, you'll love the new Tri-Shutter and Tri-Shutter Layers die set that will be available SOON on Our Daily Bread Designs website! If you are lucky enough to attend one of their Stamp Shows, you can currently pick up the dies there along with the new Double Display die! For my Tri-Shutter card, I die cut the panel in White using the Tri-Shutter die, then used the Tri-Shutter Layers die set to die cut the paper from the Old Glory paper collection. 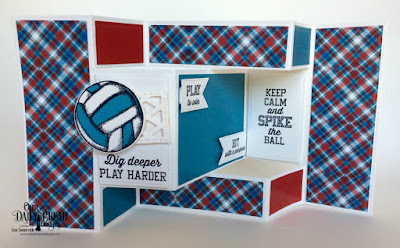 The stamps are from the Volleyball Stamp/Die Duo set, I created a volleyball net using the Lattice Background die. My next card featured the Softball Stamp/Die Duos set along with the Old Glory Paper Collection. 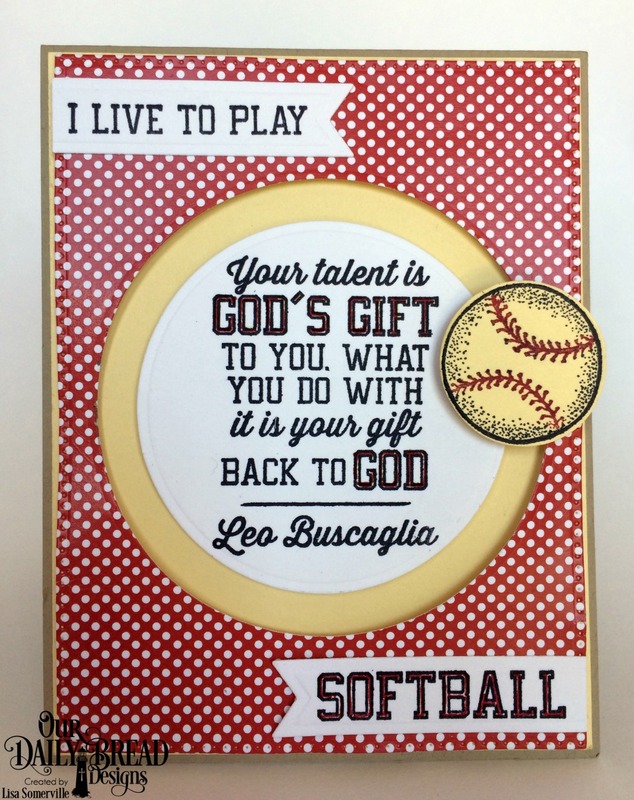 I created a Spinner card using the Pieced Circles and Circles die sets to create a channel for the spinning softball. See the video below to see this interactive card! Next I have this fun tablescape to share with you that uses products from the new release along with a few of the ODBD 3D dies! How cute would this look on a table for a birthday or sports banquet! 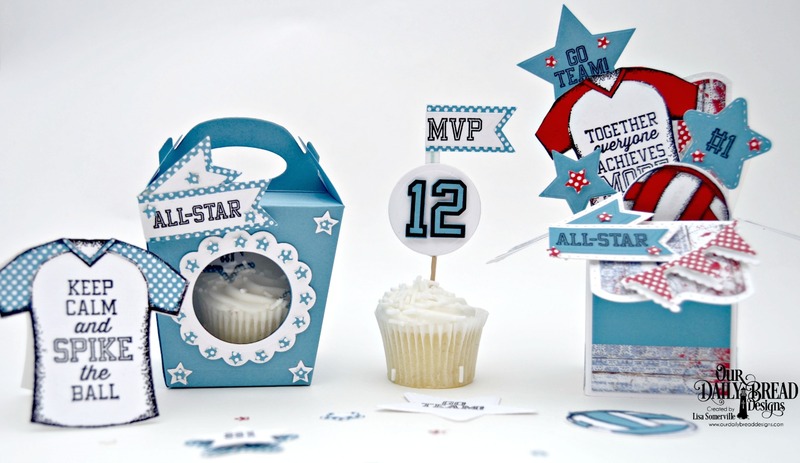 The sports die cuts and stars not only embellish the projects, but they are create for confetti! The cute jersey shirt from the All-Star Jersey stamp set can be made into a card by stamping the image on a piece of folded card stock, then placing the cut line of the die just above the fold line. Three randomly selected winners will each receive a $25 gift code to the ODBD Website just for commenting on the Design Team cards! You have until August 2, 2017 at 9:00 p.m. EDT to leave your comments. The Winners will be posted August 3rd, on Our Daily Bread Designs Blog, so be sure to check back there to see if you won! Wow, Wow, Wow!!! These are just amazing!! Love your awesome and creative ideas. Thanks for sharing. Beautiful creations!! I love the tablescape you have created. So so pretty. WOW, I love your cards as well as your other creations. Talented!! AMAZING!!! Love the tablescape. These projects are so fabulous. The softball card is so cute the way the ball moves around the front of the card. You out did yourself on these. Thanks for sharing your genius creativity. Thanks for sharing your sports themed projects. Great samples Lisa! Love the table scape!!! Very clever use of the 3-D boxes! Whoa! Were you ever busy!! Awesome samples, cupcake looks yummy too! Lisa all three samples are wonderful! Your table scape is incredible!!!!! Totally cool! The party favors are fabulous! My grandson would love them! I would love making them, too! What wonderful ideas on every blog. This is one talented team and you had a super bundle to use. What an awesome take on the release, Lisa!! Love them all, especially love your party favors and 3d boxes!! Incredible job! Incredibly amazing, Lisa! You hit it out of the ball park with these awesome samples! LOVE the festive table decorations especially! You've really showcased these sports themed stamps and dies perfectly! Hugs, my friend!